Hi everyone! This is long, long overdue but just a quick update on our first year of marriage. So many new and exciting changes happened after our wedding. The most exciting news of all happened in November – we found out I was pregnant! Baby boy was due to make his appearance in August. In March, we went on a family trip to California for our friends Kristie and Mike’s wedding. In April, we found out we were having a baby boy. In August, Xavier finally made his appearance at 7lb 3oz, 19 1/2 inches and our lives haven’t been the same since. The first two months were a little challenging, getting used to the no sleep and doing everything according to the baby’s schedule but now that he is almost 5 months old, life is getting a little easier. Xavier is such a happy baby. These days he is learning how to roll over (he can roll from his tummy to his back and from his back to his tummy), and is greatly anticipating being able to eat solids (he’s constantly watching us eat whenever there is food around – like his momma). We just celebrated our first Christmas with the baby, and my first Christmas off since I started working. We had such wonderful holidays – Thanksgiving and Christmas with the baby. Danny and I are so looking forward to what 2014 will bring to our family, and we can’t wait to watch Xavier grow this coming year. It has been over 3 weeks into our journey of marriage, and everything has been going well. Life has resumed to business as usual, or as close to usual as possible after the effects of hurricane Sandy. hope everyone made out okay through the storm. however a by product of extensive wedding planning is the post mortem wedding withdrawal that a certain someone is now experiencing. *ahem* I guess that is the case with any bride that has to plan out a wedding. We have also been going through some extensive house cleaning now that both of our possessions now have to share the same space. That is probably the biggest adjustment that we have had thus far. Speaking of house cleaning, we also still have some frames leftover that were used as the table numbers at our wedding. Probably due to the fact that the flower vases were not for grabs, guests assumed the same went for the numbers. That is actually not the case, so if there was a picture that you enjoyed, please let me know and we can arrange to get it out to you. The ones remaining are listed below, let us know if anyone wants one! My bridal shower was this past Saturday…I just wanted to say a big thank you to my family and my bridesmaids: Melody, Stephanie, Marchesa, and Cynthia for throwing me such a beautiful shower. I’m so overwhelmed by the thoughtfulness and generosity of our friends and family. Thank you to all of you who came. It was really beautiful…I loved the theme and the decorations that the girls did for the shower. Danny and I are now in the process of unpacking and finding places for all of the gifts that everyone generously gave us. I think we need to find a bigger home to live in – my 2 bedroom condo isn’t cutting it anymore. Time is flying by so fast, we have just a under 3 months before the wedding. Things are coming along so far so good. We ordered out invitations last week, hopefully they will be done within the next week and will be sent out by the second week of August. We went to see a few florists, and I think we found the one we’re going to use. We have one more appointment tomorrow, then we will make our decision. I got my wedding shoes this week!! Still waiting in the mail for them (I got two pairs >_< )… hopefully they fit well and are comfortable….but who am I kidding. Even if they’re not comfortable, I’ll still wear them. Anyways, I just wanted to share a few websites that have helped me along the way with the planning, to give me ideas for the wedding. Weddingbee- I am currently obsessed with this website. There is a forum where people can discuss anything wedding related (and not wedding related) – I love forums. They also have a great DIY section for anyone adventurous enough to DIY their wedding things. There is a classifieds section where people sell their wedding supplies after they’ve used them for the weddings. They even have wedding dresses there! Pinterest - For those of you who have not caught the Pinterest bug, try it out…it’s so addicting. This has been a great way for me to organize wedding ideas that I’ve seen online. I gave my bridesmaids access to my board so that they can “pin” things that they think would be good for the wedding to the board. It’s also great for finding ideas and websites that other brides have found – they have a section just for weddings. Etsy - Can I just tell you how much I love this website, not only for the millions of wedding items they sell on here, but for pretty much anything you can think of. If you know me at all, you know that I having things that are different (that no one else has), and Etsy is the perfect place to find these things. They have everything from invitations, to wedding gowns, to veils, to jewelry (I love their jewelry). And I love the idea of supporting artists who aren’t mainstream. Ruffled - I came across this website on Pinterest. What I really like about this website is that it reminds me of my favorite store, Anthropologie. A lot of their posts feature vintagey style weddings. They also have a DIY section, along with a real weddings section (where you can get ideas from other people’s weddings), photo galleries, and a recycle your wedding section, where people sell their used stuff. As you can probably tell, all I ever do these days is look online for anything wedding related. So many things to help a bride out…what did people do when internet didn’t exist? =D Til next time… thanks for reading! Hi everyone! A little update on the wedding plans for those of you who follow our blog. *Whew* Time is flying by and we only have 105 days left until the wedding. Things are coming along well. Actually, we haven’t really done anything in the last few months because we (actually, it was just me) were so OCD about finding and booking vendors back in January. As we get closer to our date, I’m getting more and more nervous. Not about the wedding itself, but just getting all of the payments together, the weather (since our ceremony will be outside), and just fixing up all the little details. The only major things we have left to do are look for a florist and order invitations. Not too bad, but we really have to get on the ball with looking for a florist. One exciting thing that recently happened – my dress finally came in last week!! I ordered it in February and it came in last Thursday. So excited to see my dress since the dress I tried on at the salon was about a size too big on me. The bridal salon won’t let me have a fitting until August, so I have to be a little more patient and wait. Anyway until next time… Thanks again for visiting our blog! “You wanna come to my party? I wouldn’t give you a chance. I didn’t even know this song had a video, so I had to share. The mother of all line dances, if you cannot get this step down, please do not proceed to the other videos until you get this one down. If line dancing had a foundational move, it would be the electric slide. Don’t be that guy that is 4 steps behind and bumping into everyone! A variation of the electric slide, if you can get the first dance down, you should be okay here. This version of the song is likely going to be different from the one that you will hear. This one is easy. If you cannot follow along with the video, literally just listen to the guy’s instructions in the song. It’s that easy (warning: you are on your own with learning how to cha cha!). Stepping up the line dance game is Todo Todo Todo. Once again I did not know that there was a video to this… but that does not really help anyone since Daniela Romo does not perform the line dance for us, so here is an instructor to help. The dances are starting to get tricky now, so pay attention! I have no clue who they are, but that is probably the clearest footage I could find that you can follow along with. Actually I don’t really know this one either, so we can all look like fools on the dance floor if this one gets played! That’s all for now. Promise the next post won’t be as media intensive (unless you like this kind of stuff). Til next time! For my fellow male readers for this blog (do they exist? 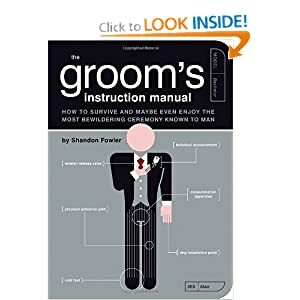 ), and are thinking of tying the knot soon, fear not, I have some recommended reading for the situation. As wedding planning can get hectic at times, it never hurts to have a point of reference to refer to when there may be questions that need answers. Granted the bride handles the bulk of the planning, but there may be some details that you could potentialy overlook (this goes for the bridge too!) You are probably thinking that Google can probably answer 95% of your questions these days, but hey I’m an old school kind of guy that just likes to have a physical book to flip through. - What has my fiance done with the woman I love? Plus it comes with hilarious illustrations to go along with the information (I admit, I may have judged this book by the cover). 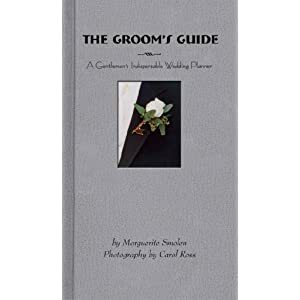 Either way, it is highly informative, and makes the wedding planning process a bit less brain wrecking than it needs to be. I would consider this the more pocket handbook reference guide, for no frills information without the accompanying pictures. If you prefer the straight no chaser information with no fluff, you may want to pick this one up. That’s it for now. Til the next post! I will start off with some of the pieces I will be working on for the wedding, meant to be as bonus favors for the guests. Each one will be unique, meant to tell a story about us and the stages of wedding of planning (the good, the bad, the exhausting). Hope you enjoy the preview, and Im open to ideas and suggestions, as this is still an ongoing project! Enjoy! We are thisclose to booking our honeymoon Last week, Danny and I went to Liberty Travel to inquire about a honeymoon to Riviera Maya. The lady who was helping us ok. She gave us a brochure and a few prices to some hotels that looked interesting in the brochure. We decided to continue looking at other travel agencies before we made our final decision. Since I broke my toe last weekend (don’t ask), I am unable to work until I can wear a regular shoe, so I had the weekend off again. We were able to look into another travel agency yesterday. The next one we visited was a few doors down from a restaurant that I frequent in Metuchen. The store was already closed but the owner was still there and saw us at the door. He was nice enough to let us in and to see us even though the store was closed. He seemed very knowledgeable and gave us two resorts off the top of his head when we told him we were interested in Riviera Maya. He showed us the websites and pictures of those resorts. We left his travel agency feeling better than we had after we left the first place. I am just waiting to go to one more travel agency before we make our final decision. I’m so excited that we’re going to Riviera Maya for our honeymoon. This past week has been a very sad week for my family. My cousin’s husband passed away at the age of 62, leaving behind his wife and their two boys – Ned and Neil. My heart is so heavy for my cousin and their kids. It was so hard to watch the family in so much sorrow at the funeral yesterday. It happened suddenly…we just saw him last month at Jonah’s dedication and he looked good, despite his health problems. But I guess when God calls you home, it really is your time. Kuya Boy was supposed to be one of our sponsors for the wedding. I don’t really know if I want to find a replacement for him…would it be ok to just have Ned or Neil walk down the aisle with their mom in place of their father?